The God of the Heavens thundered across the skies brandishing a terrifying thunderbolt. “I”m Thor!” he bellowed bloodthirstily. Just eleven years ago in 2002, a team were out from the Institute of Archaeology at the ZRC SAZU research centre. They were sampling wood from findings at an ancient settlement about 20 kilometres outside Ljubljana. So there they were, trolling around in a deep ditch, having a lovely time, when they stumbled on a 5,250-year-old wheel. It had an axle and everything. It was made with two ash panels held together with oak wedges and its sophistication astounded all who came across it. Experts say it was part of a two-wheel pushcart. The wheel: the first mechanism to cheat friction and free man from the drag of the earth. What a great day it must have been when man discovered how useful round could be. Spool forward some 3,433 years or so. In 1817, Baron Karl Drais , a minor member of the Mannheim aristocracy, had an idea. What if you got two wheels, and connected them so one could sit on a saddle and bowl them along using your feet? Revolutionary! Extraordinary! Now you could use your legs to take you places at speeds your ancestors could only dream of. The Baron called it the Dandy Horse, amd advertised it using a real Dandy. It is usually held that a Scottish Blacksmith had the wit to see that this was just a very silly idea: for what about uphill? The onomatapeaically-named Kirkpatrick MacMillain designed the boneshaker, but I believe he declined to advertise it using real bones. He is rumoured to have been the cause of the first cycling accident though, knocking down a little girl, for which he grudgingly handed over five shillings. But just to look at the saddle makes one wince. The rider of this contraption may have got around fast, but you’d know him by his walk. And the vibration: with no suspension this man must have been a permanent blur as he walked along the village street. Yesterday was my birthday. I had asked for a second-hand, old-fashioned sort of bike. Phil put me and the kids into the car and drove us to the bike shop and the first bike on the left was the bike of my dreams: pale blue, old-style, the sort you can put a basket on. 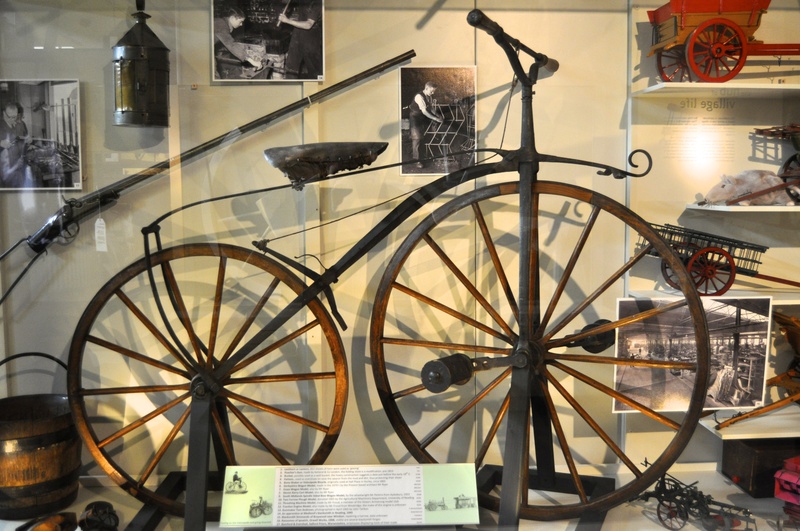 The Pendleton combined the advantages of the Ljubljana wheel and the boneshaker with modern advances in bike technology, including the invention of aluminium. It had leather handles and a thaddle created lovingly for wobbly middle-aged bottoms. Though I believe Paris Hilton has one. A Pendleton, I mean, not a wobbly middle aged bottom. I thought, Phil hasn’t bought me that one. It will be another one Phil has bought. We went downstairs and waited. And presently the pale blue vision was brought out for my perusal. Happy Birthday, Kate, Phil said. We couldn’t fit it in the boot: I had to cycle it home. 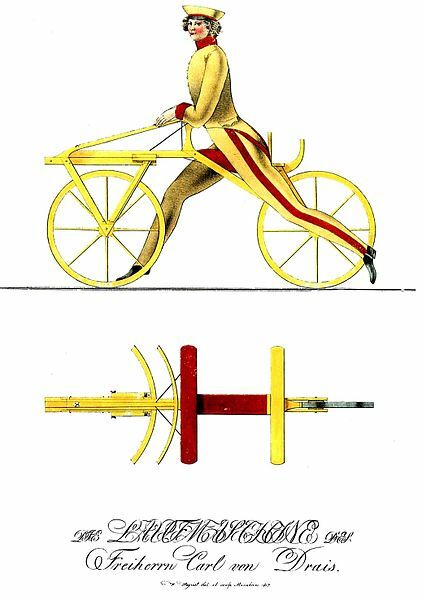 It made cycling easy, and I uttered a silent prayer of thanks to those Ljublana wheelwrights and the Mannheim Baron, and Kirkpatrick the Boneshaker inventor, for their part in this little dream on wheels. Posted in Quirks of History, Shrewsday MansionsTagged bicycles, boneshaker, Dandyhorse, ljunljana, wheelBookmark the permalink. Thounds like an exthellent idea, Sidey. We had a cowhand called Thor once and he was scary. Great post! Happy birthday, Kate. And what a lovely cycle. 🙂 I love cycles, and always feel sad about the fact that I can’t ride one any more in this city. I grew up in a town where we could cycle everyday. It is one of the nicest things you can do with your legs. I couldn’t agree more, Banno! But you do need a place whcih supports cyclists. Our place s ridled with cycle lanes, so I expect many happy hours of cyclign ahead. Thanks for the reminder that there was a bycicle know as the boneshaker. What a name, I think it was much more about the surface they rose on than the bike itself. I think you are right, Steven. My brain feels addled just thinking about it. When I saw it yesterday, Kate, I was SO impressed. Good on Phil for taking such care. Happy birthday all this week!!! hahahaha – a bit thor hey? Happy birthday for yesterday Kate – hip hip hooray 🙂 Your bike sounds lovely – here’s to the wheel invention! Huzzah for wheels in general and mine in particular, Gabrielle! wonderful post Kate. I missed out on so many. It’s designed as a dip-in site, Jas 😀 Lovely to see you! I didn’t realise it was now possible to buy traditional new bikes – I love the comfy looking seat and handlebar grips – glad you had a good day. What a fantastically cool bicycle. The only downside is that a bike like Paris should ride a bike that. 😀 Always forthright, Roger. You do make me feel a bit better about wobbling around on my bike though. A faint memory from English lessons, Tom 😀 Lovely to see you on Google + today! Happy cycling – treat yourself to the basket – isn’t it wonderful how old and new get together – sit up bike but great gears too! Yes, the basket is on its way, Elspeth. But I have to cycle back to town to get it! And you are right. This is the perfect combination of old and new. Happy Birthday, and enjoy that bike! We might actually be able to get ours out now that spring looks like it’s finally here. Ah, Spring days, Carrie. Nice to be through winter at last. You’d know him by his walk. Heh. Your bike is most excellent, Kate. I love that Phil got you the one you wanted. I hope you had a lovely birthday. Big laughs here about being thaddle thor. I once had a stationary exercise bike and had to give it up because of the uncomfortable thaddle. Most of today’s bikes, at least around here, don’t look much better. Yours looks tolerable, at least. What a great-looking bike! I’m glad you got the birthday bike you wanted. I want to get a bike for my birthday in June. I, too, want an old-fashioned girls’ bike kind of thing, with a big saddle and a basket, just like I had when I was a teenager. Have great fun. I need to get my balance back. Happy Belated Birthday! I have to confess I have had my eyes on a very similar bike! I hope you have great fun with it! Thanks, Belle 🙂 I feel sure I will! Thanks, Barbara! This is the first bike I have ever had that hasn’t been really hard work. The aluminium frame helps, I think. Have a lovely Spring and Summer of cycling on yours! Thanks, Tandy 🙂 Only very mildly thor, thanks! I covet that beautiful retro-style bicycle. 😀 Happy Birthday, Kate. What a beauty. Happy belated birthday. Enjoy the ride. With a thaddle like, that, life should be smooth. It is a thooper-thaddle, Judy. I am really enjoying it! I once had to ride a new bike home because it, too, didn’t fit into the boot. It was one It one of the seventeen year cicadas. Do you know about them? They stay buried in the ground for 17 years, come out on the 17th year, digging up through the ground, millions of them. They flock to any surface they can cling to, make lots and lots and lots of racket attracting their mate, have a quick date, then funnel back underground. It is horrible and exciting at the same time. Dogs love them. Macauley would be in nirvana. Anyways, there I was, needing to ride my new thet of wheels home, only, I was dodging flying cicadas and wearing thandles and a rather randy one got stuck in between my toes in my thandles. Happy Belated Birthday! What a wonderful story and wonderful gift, with a very fine thaddle, even though you may still be a bit thore. A 17 year cicada in your thandal! Horrors!!! My friend and I regularly ride two original penny farthings (they are called high wheelers over here) through the Golden Gate Park in San Francisco. The ride is actually calm and stable because you are sitting directly above the large wheel (high center of gravity and all that). The only problem is getting on and off and not having any brakes. They are very social as everyone smiles when you pass and wants pictures and potted histories. A very belated happy birthday, Kate, and oh, your new wheels are gorgeous! I hope you’ve been pedaling your “Dandy Horse” all over.